WASHINGTON, Apr 8 2011 (IPS) - With hundreds of thousands of Haitians living in destitution as the country flounders under political, economic and climate wreckage, critics say celebrations of the inevitable profits of disaster capitalism have already begun between the right- wing President-elect Michel Martelly and his neoliberal allies in Washington. She went on to laud “new opportunities for U.S. companies seeking to do business in… Haiti as it continues on its path of recovery” under Martelly, who went by the moniker “Sweet Mickey” during his former career as a pop singer. The Mar. 20 elections were widely criticised, drawing a record-low turnout of just 22 percent of eligible Haitian voters, while tens of thousands formally boycotted the polls. However, some political observers find this statement hypocritical in light of Washington’s history of promoting assembly-line wage-slavery and ousting Haiti’s democratically elected leaders. 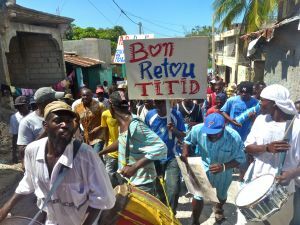 HAITI: Seeding Reconstruction or Destruction? “Since when did the so-called international community care about the will of the majority of Haitians, other than a handful of corrupt elitists?” Alex Dupuy, a professor of sociology at Wesleyan University and author of several books on Haitian politics, told IPS. “When a huge mass movement brought [former president Jean- Bertrand] Aristide to power in the 1990s with an alternative programme that was far more progressive than what exists now, he was first removed and then forced to accept a much more destructive programme devised by the West,” he added. The conversion of Haiti’s economy – from a self-sufficient agricultural producer into a nexus of urban super-slums populated by former farmers earning under a dollar a day producing garments for U.S. manufacturing companies like Levi Strauss & Co., the Gap, and American Eagle – is a story told exclusively from the standpoint of the winners rather than the victims. When President Barack Obama instructed U.S. clothing companies to source one percent of their production from Haiti early last year in a programme known as ‘Plus One’ – an effort designed to “help the earthquake-ravaged country get back on its feet” – he made no mention of the U.S.’s destruction of Haitian rice production in the 1990s. However, according to Kim Ives, journalist and co-editor of Haiti Liberte, nothing has been done to correct these policies, and, with Martelly cozying up to Washington before the election results have even been cemented, the relationship of mutual benefit between Haitian elites and Western powers will likely remain solidly intact. “During Martelly’s Apr. 5 press conference, his first since preliminary results showed him to be the Mar. 20 second- round winner, he proudly announced, ‘A week ago, I met with the Colombian Foreign Minister. [Haiti] will follow the development plan of Colombia’,” Ives told IPS. Colombian President Juan Manuel Santos, whose government is a replica of its predecessor under Alvaro Uribe, continues to be Washington’s lone ally in a region that is otherwise intolerant of U.S. empire. Plans for the creation of seven new U.S. military bases in Colombia are pressing forward despite protests, according to Ives’s most recent research. “The Colombia-plan is basically the old classic neoliberal plan that involves complete acquiescence with Washington to make the most ‘business-friendly’ environment possible,” Ives told IPS. “I imagine the tariffs under Martelly are going to be completely cooperative with U.S. industry, U.S. agriculture, U.S. finance…he will bend over backwards to do their bidding,” Ives predicted. Anyone wary of a sordid repeat of history in the Caribbean is watching closely as the new president, who has close ties to the military and former coup leaders, takes office. If Martelly’s vow to toe the Colombia-line proves to be substantive, various strategic cooperation agreements between Haiti and its socialist regional partners could be severely compromised. Meanwhile, a press release from the U.S. Embassy in Port-au- Prince announced Monday that the first batch of the 500- strong task force ‘Bon Voizen’, part of the New Horizons 2011 humanitarian mission, had arrived and would be dispersed around Cite Soleil and Saint Marc over the coming months.